Catapult Micro Market solutions allow enterprises to offer 24/7 convenience to customers and employees. Employees everywhere are enjoying the benefits of healthier meal options, increased product selection, and inviting break room environments through the 24/7 convenience provided by Micro Market kiosks. While much of Catapult’s functionality crosses into both traditional retail and Micro Market/Self-Checkout environments, there are some features and products that are especially relevant for the Micro Market/Self-Checkout industry. This section provides a list of some of the important features and products for our vending/Micro Market operators. Where are Catapult’s Micro Market Solutions Most Useful? How can retailers and businesses expand their product offerings, increase accessibility, and propel their profits through Micro Market solutions? Catapult Kiosks offer a choice of models appropriate for a variety of different environments: Flex Market and Express Market. In break rooms, work environments, or corporate offices, this hardware can offer guests and associates easy, convenient options. Click here to learn more about which hardware solution best fits your enterprise needs. A built-in kiosk security camera enables you to capture and retrieve images of anyone who may be associated with a walk-away or voided transaction. These images are accessed via an Anti-Theft widget included with Catapult Dash®. 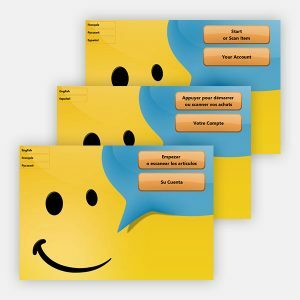 Catapult Dash is part of Catapult’s extensive back office management suite that is provided with all of our kiosk systems. The kiosk will capture an image of customers who “walk away” from transactions as a measure against inventory shrink. If the transaction is triggered as suspicious, the system automatically sends the data and image(s) to Catapult Dash to be included on the Anti-Theft widget. All of our kiosks offer interface options for French, Spanish, and Russian languages. By simply touching a button on the screen, a customer can choose their preferred language and the kiosk screen will then offer guidance in the chosen language. The kiosk will guide the user though his or her transaction with both visual and spoken commands, just as it does in English. Cutting cards out of the equation, kiosk customers can now access account information and purchase Micro Market merchandise at the press of a finger. Customers simply add a biometric profile to their account and scan their finger using a biometric reader located on the kiosk. The device is built to recognize even the most difficult fingerprints. 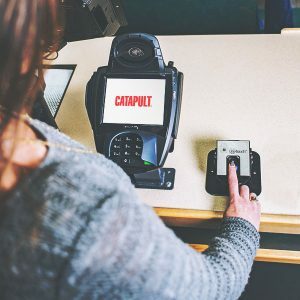 Catapult kiosks offer multi-technology card readers designed for customers who utilize RFID technology in their workplace or business. This optional kiosk add-on makes access control more fluid to align with your enterprise operations.